Referrals are proven to be a successful way to increase customer acquisition whilst keeping loyal customers engaged! The refer-a-friend rule contains two sections; the first section relates to the existing customer, the second section relates to the referred friend (new customers). The existing customer will earn points each time a successful referral takes place with their link. You can also set a minimum spend so that the existing customer will only receive the points if the referred friend spends over the minimum spend on their initial purchase. Success tip: If you're wondering how many points to give, we recommend giving your customer enough points so that he/she can claim a reward OR 15% of your minimum purchase value. For example, if that's £30, give 450 points (worth £4.50). 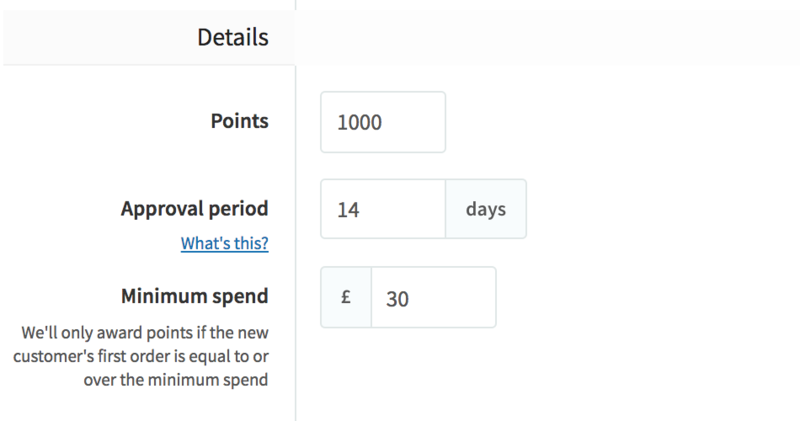 Customers will only be able to use these points after they've been approved, we recommend a 14 day approval period (or to match your returns policy) just in case they want to return the item. Friend offer: Scroll down and fill the "Friend offer" section. You can increase the chance of a referred person converting to a paying customer by providing them with a voucher to use with their first purchase. You have the option to give them a money off, percentage off or free shipping* voucher which can be used on their referral purchase following their friend's link. *A free shipping incentive voucher is not compatible with ReCharge. If you're using ReCharge integration you must choose 'voucher' incentive instead. This is the email sent from your existing customer to their friend. You can customise this email by going to Manage --> Activity Rules --> View Rules --> Refer a friend --> Customise referral email. If you want to be a pro at LoyaltyLion emails, you can read our documentation on customising emails here! Can I set the minimum spend to $0. No. The customer needs to place an order for the referral to be considered successful.